I've been having fun with this seasoning mix. I first found mention of Ras-el-hanout in my 100 Best Tapas recipe book, so I looked it up. I thought the name was going to mean something really exotic, but basically it translates to "Top of the Shop", and is a Moroccan or North African spice mix which can consist of up to 50 ingredients. Can you imagine blending 50 different spices together? I can't, and even some of the commercial mixes can have 30 different spices. And the mix of spices are considered the 'warm' spices as well. Mainly because of their deep aromatic fragrance and flavour. I looked up several recipes, and played with two different versions, and then ended up combining the two. I've got lots of Ras-el-hanout seasoning now. And next time, I'll be adding some cardamom, but this time, I didn't. And here's a side note, I have to admit that I don't care for Nutmeg or Allspice all that well. In my humble opinion, and since it's the prevailing opinion in my kitchen, it's the right opinion, both spices tend to hijack a recipe and take it over at spicepoint. That being said, I still do keep a couple of whole nutmegs handy, which I use my microplane on when I want a hint of nutmeg, just a hint, in something I'm cooking. Cause sometimes nutmeg can be a good thing. All of that being said, I really like this spice blend. Here's the recipe, and this does make fair amount, but you can keep it for a couple of months. Put all the spices in a coffee grinder or if you're using already ground nutmeg and allspice, just mix it together well. Put into a sealed jar and use in any recipe you like. I used some in my Pork Brochettes as well as in a hummus recipe . I walked over 6000 steps in the kitchen yesterday, just getting stuff ready. We got a gracious plenty of Roma Tomatoes, Green Peppers and Eggplant from Farmshare and had to do something with it, as well as feed our seniors. Luckily a local restaurant called 2 Al's provided some awesome spaghetti sauce and meatballs, along with spaghetti and garlic toast for our lunch today. We made a salad and used some of the tomatoes and green peppers along with the lettuce. There were over 80 people who enjoyed their meal. But there were still the tomatoes, green peppers and eggplant to deal with. As well as the desserts that we make every week. The tomatoes (and darn I didn't get a picture of them), were roasted and put into bags for freezing. I had two wonderful volunteers to do that for me. I wrapped up a bunch of the eggplants in plastic wrap, and will make them into an Eggplant Bake next week to be served alongside the Mojo Pork, rice and black beans. I'm also going to make some pans of eggplants up to be frozen and served at a later date. WOW. Some will be processed and frozen in pieces, while a lot of the others will be cored out and frozen whole and then we can have some stuffed green peppers for a lunch in a couple of weeks. You just don't look gift food in the mouth. Especially where we're feeding so many people and get very limited funding to do so. It's just so much fun having a large freezer at my disposal, I love to preserve food. And I love to bake and am looking forward to baking lots more stuff. And last week we served up Blackeyed Peas, Collard Greens, Rice, Roast Pork, and Cornbread. And I baked Muffins that are going to be served along with the breakfast beginning next week. We have some great volunteers who are going to be making and serving breakfast one day a week. This used to be a popular event, and was discontinued for awhile, but we're hoping to get a few people in again. I had no real plan on what I was going to make for Tapas this month, I had a couple of ideas and wrote them down, but when I looked at them again I went "Meh", they just didn't sound that exciting. And I also didn't want to just roast it and season it, been there, done that. A couple of times, and while tasty, wanted something a little different. So I went looking for inspiration in my cookbooks, specifically my 100 Best Classic Tapas. They tend to jump out at me, these inspirational recipes that is. You can find this one on Page 70. I just thought I would let you know in case you have the book and want to follow along with me. And if you don't, here's how I made them. First off, I had tenderloin and did not want to marinate them overnight or even for the 8 hours they recommended. Tenderloin will take on the flavours beautifully in less time. 3 tablespoons good olive oil, I used Coratina Olive Oil from Smashing Olive. Plus extra for drizzling. 2 tablespoons chopped fresh parsley, flat or curly, your choice. 1 tablespoon ras-el-hanout spice blend. Mix the olive oil, lemon juice, zest, parsley and garlic together. Set aside. Cut the pork into bite size pieces, about 3/4 inch square, and place into a pan, glass or plastic, in a single layer. If you're using a pork tenderloin, take off the silver skin first. Trust me on this, if you don't, you will regret it. Nothing you can do will make it palatable. Pour the marinade over top of the pork and refrigerate for about 3 - 4 hours if using pork tenderloin, or up to 8 hours if using lean pork. I did massage the marinade into the pork a little, cause I could. Take the meat out and either grill it or broil them. You can skewer a few pieces of the pork and grill them or do as I did, which was spread them out on a shallow pan, and broil them. Skewer the pieces of pork on toothpicks, sprinkle a little more parsley over the top, and then finish off with a little of a good, and I do mean good, olive oil. I had the Coratina and it finished off the dish beautifully. I'll share the recipe for the ras-el-hanout another day, and tell you how I used it in another dish. Just have to figure out what else I can use it in, I seem to have quite a bit left over. We had a crowd last night, but that is usual for us for Tapas Night. What isn't usual is that the majority of the guests went straight from here to listen to a friend of ours perform at a local venue. Debi Jordan is a talented singer who gives a lot of herself and it's always a good show. She's known for also sharing her talents to help raise money for great causes locally. So we all ended up listening to Debi sing which was a great ending for a nice evening. And a lot of great food was brought and eaten last night. I made Pork Brochettes, Mushroom Hummus and Twisty Breadsticks, along with a really yummy Hot Goat Cheese Pizza Dip, and some Marinated Olives with Feta. And you know I'll be sharing the recipes for them a little later on. I kinda got carried away, but that's not new. We had the gamut of foods, and I wish I could have sampled everything, but I was busy visiting. And having fun, and, well, gee, it was my party, and I can have fun if I want to. I love platters like this one, there's a little something for everyone. Even if the photographer doesn't, ummm, get the shot from the right angle. There were these yummy little bites, and I had to sample a couple trying to figure out what was in them. These are some of my offerings, from the left, the Pork Brochettes, then the Mushroom Hummus, and some Marinated Olives with Feta. I took this shot just before we had the major influx of food. Or you could also say, just before most of the guests arrived, laden with food. We had some lovely roasted vegetables, always popular. Although, by the time I got to the table to sample some, they were gone. There was Gumbo, with rice to go with it as well as hot sauce. Just in case you like a little heat. Which I do, and did. Well, I added a few dashes of hot sauce. And to continue with the theme, well, yummy food brought in pots. There was this Portuguese clam/sausage stew. I could have just drunk the broth, so flavourful. It was served over a piece of toasted bread. And the final big pot dish was this one. I made some crunch twisty breadsticks along with some softer breadsticks to dip into some Goat Cheese Dipping Sauce. I'm still trying to come up with a name for this, but it was so good. (I know I'm patting myself on the back, but I'll tell you all how to make it a little later on). BTW she really liked the crunchy twisty breadsticks. There were Tortilla wraps, and I managed to snag one before they disappeared. This is one of those dishes I've never quite mastered, I'm never satisfied my interpretation. So glad other people make it so I can eat it. How about another overview of the table, before I continue. There was some lovely fruit that was brought and and look at the pretty presentation. There is just something about fresh fruit, that well, makes the other indulgences a little less, guilty feeling. As well as veggies, well, a little less guilt inducing. I didn't get a chance to sample these, but it looked good. I love cauliflower anyways. Pasta Salad. I don't need to tell you that I had to have some. And see, I did get a shot of the Pineapple. As well as a shot of these sandwiches. The ones at the front were cucumber and cream cheese and the ones at the back were tuna. Fried Rice, and I did sample a little. Good. Here's another shot of the table, from a slightly different angle. There wasn't a lot left over last night. As well as apple pie. I guess I need to go and face the unwashed wine glasses now. I left them all to go and listen to some great music last night. I was kinda hoping the glass fairy would come in and wash them for me, but she or he hasn't shown up yet so I have to do it. And I'll be sharing some more recipes later on this week. I have a great twist on some hummus, made a new to me spice blend which I find I really like, it's called Ras-el-hanout, I also made hot Goat Cheese dip for breadsticks, as well as some Pork Brochettes. I'm having issues with Blogger today, so this is the only picture I could get to show up. As soon as I figure a workaround or find a solution, I'll post more. OK, so I got a little surprised the other day as I was looking at my stats. My next post was going to be my 500th post! Which is this one, and what do you say? Well, obviously I've had a lot to say, right up to this, my 500th post. I've gotten to travel all over the world, recipe wise, trying food from a lot of different cuisines. And what a world of deliciousness there is out there. And I'm still traveling and trying and learning. And I've gotten to know some great bloggers, been totally intimidated by some of the stuff they do, and found wonderful recipes as part of the Secret Recipe Club. I had thought of making a totally incredible dish, then casually mentioning at the end of the post that this was my 500th post. But I thought it might get lost, and gee, I think that the 500th post deserves to stand on it's own, as well. Have I mentioned the number enough times? No? I think I have. So, just for fun, let me do a quick look back on the very first post I ever did, on this blog that is. 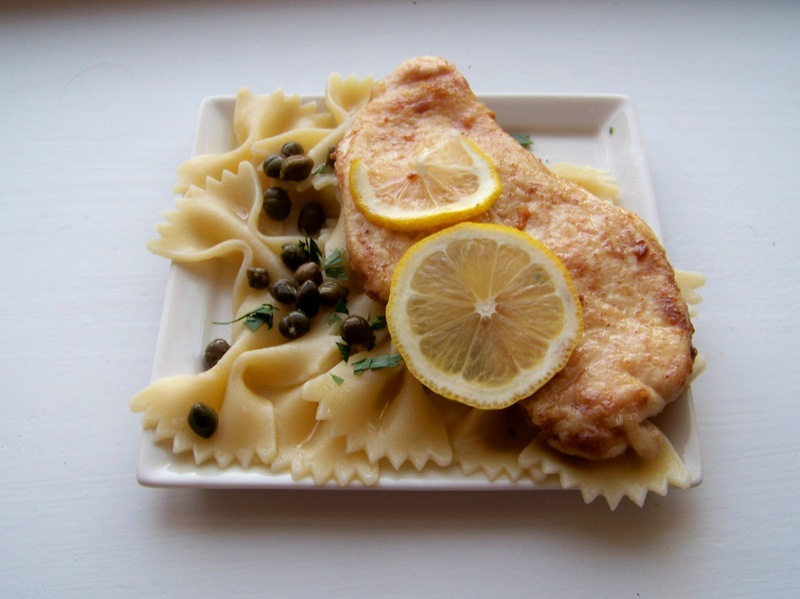 My next blog posting was a recipe, for Chicken Piccata, Sid Style. Which ranks up there as one of my all time favourite dishes. Which, I just happened to make for us last week again. Which reminds me, I need to put capers on the shopping list, I used up the last of them. I also made some Refried Beans that month and shared the how-to's here. And this is something I do make a lot. Why buy a can when you can make it yourself ? and this way it's cheaper and you know what's in it as well. I will be forever grateful to Ta for showing me how dead simple this is. BTW, this is killer on Nacho's and inside burrito's and just eating with a little bit of cheese on top. And since I do like a little hot, which you might have surmised if you've read any part of this blog, I talked about my Hot Buffalo Bites which I made for Boat Club. I make this for my DH from time to time as he's not a fan of Buffalo Wings. That first month I also talked about my Spice Drawer. I don't know if I should admit it or not, but I've got lots more spices now. In fact, I have some residing in the pantry at the moment, just waiting for their moment of glory. And then I made me some Black Olive Tapenade. If you have leftover black olives, try making this as a nice spread. I can eat it by the spoonful myself. Even for myself, I still made the plate look pretty. That month I also made some Sushi, California Rolls to be exact for our Tapas Night. . I also made a Tri Colored Terrine, which kinda bombed. sigh. And I finished off the month with a Chicken Fried Chicken Which makes an awesome topper for a salad. Well, that's a reprise of my first month's blogging. I still remember some of those dishes very fondly. I might have trouble remembering someone's name sometimes, but I remember the dish they brought to the gathering. Also I want to share this link, where Rakuten Essential reblogged my post about Vegetarian Potstickers. I got a kick out of that one. And it's Tapas Time this weekend, so you know there's some deliciousness coming soon.